Ice Cream Social: Thank you ! A HUGE thank you to all who came out to our ICE CREAM SOCIAL! It takes many people to put on an event such as this. There were also many parent & student volunteers that assisted with set up, ice-cream scooping, bouncy castle supervision and clean up. THANK YOU! The WINNERS of the silent auction are Bernadette Dunnigan, Megan Enns & Nicole Montgomery. Congratulations! Thank you to all of the class representatives who have stepped forward! We are still needing reps for Div 2 (Mr. Thomson) and Div 3 ( Mrs. Teegan). We are also looking for Reps for Mrs. Hill (music/play) as well as Mr. Capri (Band) and Mr. Kabok (strings). Please contact Jane Alpen if you can help! Montroyal Programs start this week! Come and help shape the G7 Graduating Class of 2018 planning - including fundraising events, leadership opportunities, legacy gifts and the Celebration Ceremonies & Dinner. If you can't make it and are interested in volunteering or have ideas please email Jana Madill. Professional Day. School is not in session. We encourage walking or cycling to school to improve students’ concentration and overall health, even a few blocks or through the forest makes a difference. If driving please review the drop zone process Getting to School Safely to ensure a steady flow of traffic. Grade 5 parents see our Move It Team - Traffic Patrol page. ​Remember you are driving through a residential area, watch your speed it is a 30km zone. ​Please drive down the street as if it were your own neighbourhood. Ordering with SPUD is simple and deliveries to the Canyon Heights neighbourhood is every Tuesday & Friday. 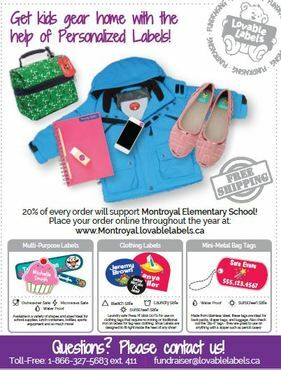 (2) At checkout, enter the promo code FUNDRAISING & then select MONTROYAL from the drop-down list and complete your order​. (3) Your order will be delivered to your home & MONTROYAL will receive a donation from SPUD.ca! You can order as many boxes as you want, as many times as you want. The FUNDRAISING code cannot be combined with other SPUD promo codes on the same order. ​Select Produce Box Fundraising under the 'Home' tab to find this page. Who doesn't love the delicious baked goods at Cobbs? Just say MONTROYAL when making your purchase and 5% is donated to the MPAC. Get organized and keep your new back-to-school purchases identified with Lovable Labels! 20% from every purchase goes to the Montroyal PAC (with code). Information coming soon - watch this space! Both new and returning families need to register into the system. If you do not register, you will not be able to purchase hot lunch nor will you receive the Sunday school update emails or be listed in our contact database. PLEASE click here for more information. Did you purchase an Edupac? ​BCCPAC strongly believes that every child deserves equitable access to a full day of education. Since the spring, we have been actively advocating regarding the problems faced by families of children with special needs who are unable to attend school full time. BCCPAC is conducting a three-minute parent survey to confirm how widespread this issue is across BC public schools:https://www.surveymonkey.com/r/BCCPACFullDaySchool. The survey will close on October 6, 2017. BCCPAC will be taking survey results directly to the Ministry of Education with the expectation that changes will be made to end discrimination against children with complex learning needs. ​The NVPAC are in need of a REGISTRAR (updates information and communication to/from member PACs), BCCPAC representative (helps keep everyone updated on BCCPAC deadlines and information). If you are interested in getting involved, please contact www.northvanpac.org .